"My brethren, be strong in the Lord, and in the power of his might. Put on the whole armor of God, that ye may be able to stand against the wiles of the devil. For we wrestle not against flesh and blood, but against principalities, against powers, against the rulers of the darkness of this world, against spiritual wickedness in high places. Wherefore take unto you the whole armor of God, that ye may be able to withstand in the evil day, and having done all, to stand. Stand therefore, having your loins girt about with truth, and having on the breastplate of righteousness; And your feet shod with the preparation of the gospel of peace; Above all, taking the shield of faith, wherewith ye shall be able to quench all the fiery darts of the wicked. 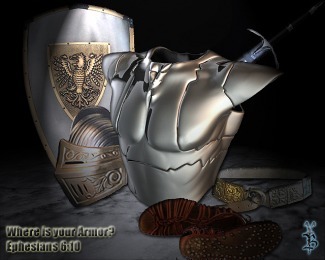 God's armor brings victory because it is far more than a protective covering. It is the very life of Jesus Christ Himself. "[P]ut on the armor of light," wrote Paul in his letter to the Romans, "...clothe yourselves with the Lord Jesus Christ." (Romans 13:12-14) When you do, He becomes your hiding place, and shelter in the storm--just as He was to David. Hidden in Him, you can count on His victory, for He not only covers you as a shield, He also fills you with His life. Since living in the safety of the armor means oneness with Jesus, we can expect to share His struggles as well as His peace. Remember, God has promised us victory in the midst of trials, not immunity from pain. So "do not be surprised at the painful trial you are suffering, as though something strange were happening to you, but rejoice that you participate in the sufferings of Christ..." (1 Peter 4:12-13) Christian heroes who have been tortured for their faith continue to testify to the supernatural strength--even joy--that enables them to endure unthinkable pain. This wonderful truth has become reality to all who believe and follow Jesus. When you put on His armor, His life surrounds you, keeping you safe, close to Himself, and free to be His precious friend and trusted companion. So "put on Christ." (Galatians 3:27) He is your victory! How do I put on the Full Armor of God?